better than i could have imagined: Parker's birth story. I am getting ready to finally write out Grace's birth story and post it here on the blog....so I thought I'd go ahead and post Parker's as well. 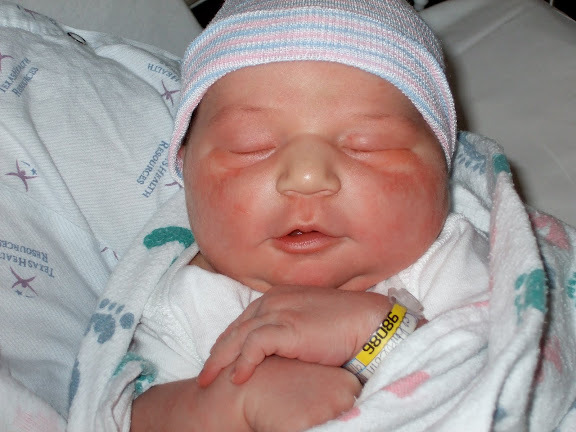 September 15th, 2007, (your due date) came and went. I was ready to have you! On Tuesday, September 18th, 2007, at about 4:20am, I woke up. This was a pretty typical occurrence so I didn't think much of it at the time. I just laid there for a while like I always did, hoping that maybe I would go back to sleep. But alas, I did not. Instead- I started having these little cramps. Didn't think much of that either, because I had been having these on and off for a while. Then, I started noticing that they were coming about every 10 minutes. I got up, started timing them, and they were pretty consistent, but not too painful. 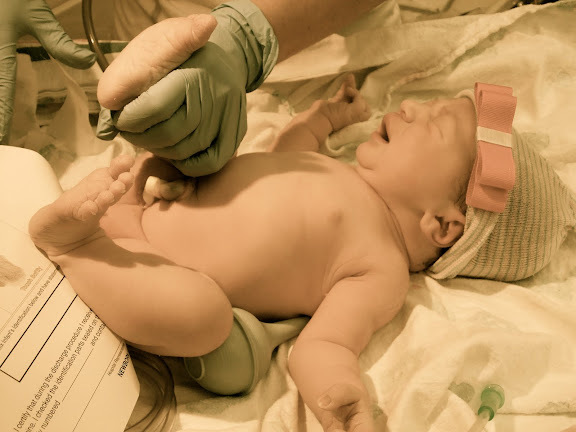 We had attended birthing classes and from what they said (and the doctor), we didn't need to start heading to the hospital until my contractions were at lesast 5 minutes apart. So to pass the time, I checked e-mail, did some last minute cleaning, and played Nintendo. And this wasn't just any Nintendo, it was the old one that I used to play with when I was a little girl. Your dad hooked it up for me a few weeks before you came so that I would have something to do when I couldn't sleep. I still sent Daddy to work that day because I felt like it would be a while before you came. 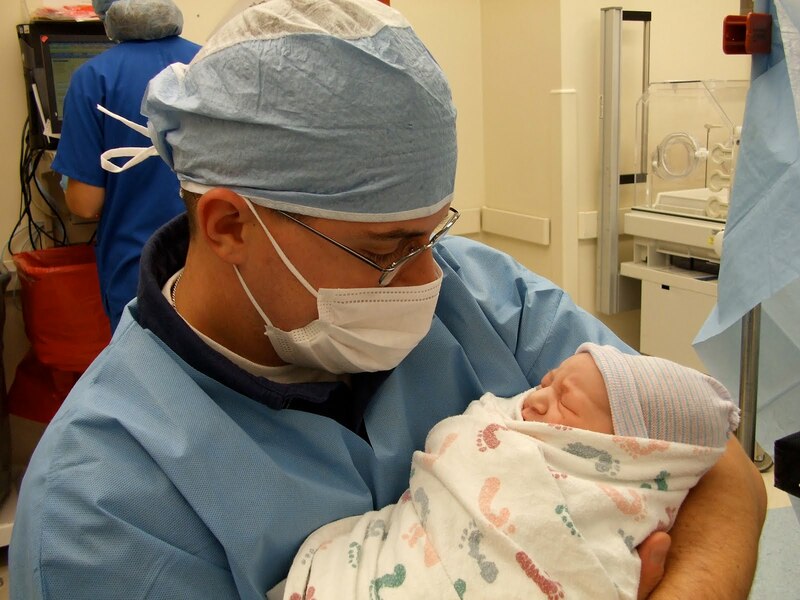 But by 8:15 am (which work had started only at 8am), I had already called him and told him he come on home because the contractions were getting closer to 5 minutes apart, however, they were still not very painful. I wrote every single contraction down and how long it lasted. It makes me smile now to think back...knowing how excited and anxious I was to meet you. I wanted to be sure and have all the information I needed when I called the doctor. I even took it with me to the hospital in case the doctor wanted to see it--which he didn't. We called all of the granparents, Aunt Sister, and a few friends to tell them that we thought, "We're going to have a baby today!" When Daddy came home, we went for a walk up and down the street to hopefully speed things along. Around 9:30 am or so, I decided to call the doctor to just see what he wanted me to do. I actually spoke with Dr. L and told him how my contractions were and he told us to come on in and we'd see how things were going. I had contractions on the way to the hospital and they seemed to be getting a little stronger. But once I arrived to the doctor's office, they took me back to take my blood pressure--which was good. After that... I had to wait about 15 minutes before I saw the doctor. And, of course, it would happen at that time.... my contractions stopped for about 20 minutes. Since 4:20am they had not stopped, but now that I am here at the hospital, they were going to stop? I remember Dr. L walking by the little area where they take blood pressures and weights...and I guess from the look on my face....he stopped and said, "Did they stop on you?" He knew! They finally took me to an exam room and the doctor checked me. I was only dilated to a 1 (at 39 weeks I was still not dilated at all!). He decided to send me triage to hook me up to the contraction monitor to check the frequency of my contractions, and if after 2 hours, we had made any progress. The plan was....if I had progressed any in the 2 hours then I was in labor and they were going to admit me. If I made no progress, then I was in false and/or early labor, and they were going to send me home. Well- during the 2 hours, I was having contractions that were 3 minutes apart, but I had made no progress! Nevertheless....he decided to admit me anyway since I was 40 weeks and 3 days pregnant. It took them about 45 minutes to get my room ready, and during that time and they began to call your grandparents and some of our friends. Shortly after getting in our room....a nurse came in and started my IV. 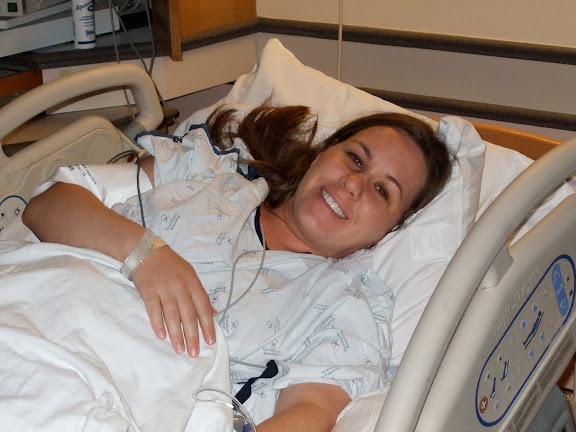 Not long after (around 2:45pm)...the pitocin began being administered..... and by 3:15 pm, I was ready for the epidural! Soon after the pitocin began, but before the epidural, Dr. C came in and broke my water. Around 5pm, I asked the nurse if I could roll over to my right side since I had been on my left side for a couple of hours. She said yes and began to help me. Before I even made it all the way to the right side, monitors began going off because your heart rated dropped below 60 beats per minute--normal range is between 110 and 160. They asked Gramma and Aunt Sister to leave the room. Only Daddy stayed, and the nurse asked for back-up and for the doctor to come immediately. She flipped me back to my left side and quickly place an internal fetal monitor in order to watch you more closely. Nurses and the doctor came almost immediately. After what seemed like and eternity, you were stabilized and I was confined to my left side for the remainder of the labor. 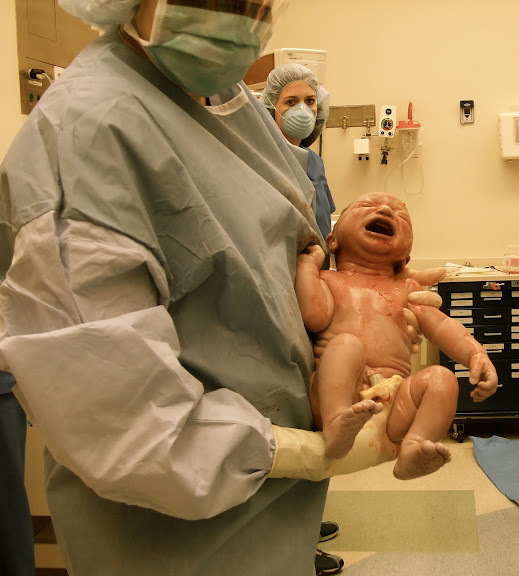 They said that maybe your cord was wrapped around your neck and that when we went to the right side, you could have possibly been compressing it, thus not allowing you to receive enough blood. This scared us pretty good (and that's really an understatement). And it was in hindsight that I realized maybe we should have just let them send us home earlier! It was a true lesson for me because I remember so much how I wanted to stay. I wanted to have you that day! And in the end...everything worked out, but it was still a valuable lesson learned in patience. So by 6:30 pm, I was dilated to a 4. We were making some progress, but my body was not handling the pitocin well, in that, I would have 5 minute long contractions (as opposed to 60-90 seconds that they are supposed to be) that were hard on you. Your heart rate would stay in the low 100s when there wasn't a contraction, but dip into the 80s and 90s during the contractions. At 9pm, the nurse checked me again and said that I was dilated to a 9 and almost 100% effaced. This meant that it was almost time! I remember in a fleeting thought, my stomach sank, and I thought, "I can't do this." And I say 'fleeting' because it was such a mini-thought....that was quickly followed by an overwhelming sense of calmness. I knew I could do it. And I was going to be able to finally meet you. So the nurse began to get things prepared for your birth in the room, and at 9:30pm she checked me one more time. Only this time....she realized she had made a mistake and I was still only dilated to a 4!!! The doctor came in...and she was not very happy. 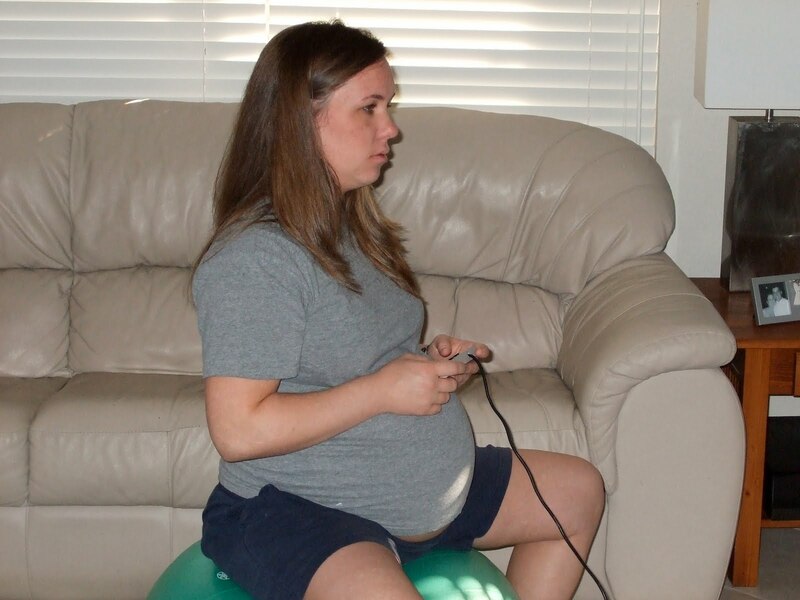 She told me then that she'd give me 30 more minutes to see if I made any more progress, and if not, then she wanted to do a c-section. But by this point, we were still worried about you and your heart rate, and felt that nothing had changed in 3 hours, why would we think that anything would change in 30 more minutes? Ultimately- we just wanted you to arrive safe and sound. So we decided to go ahead and have you by c-section. The nurse anesthetist came in and began administering more drugs to numb the lower half of my body. And not long after...they were wheeling me into the OR. 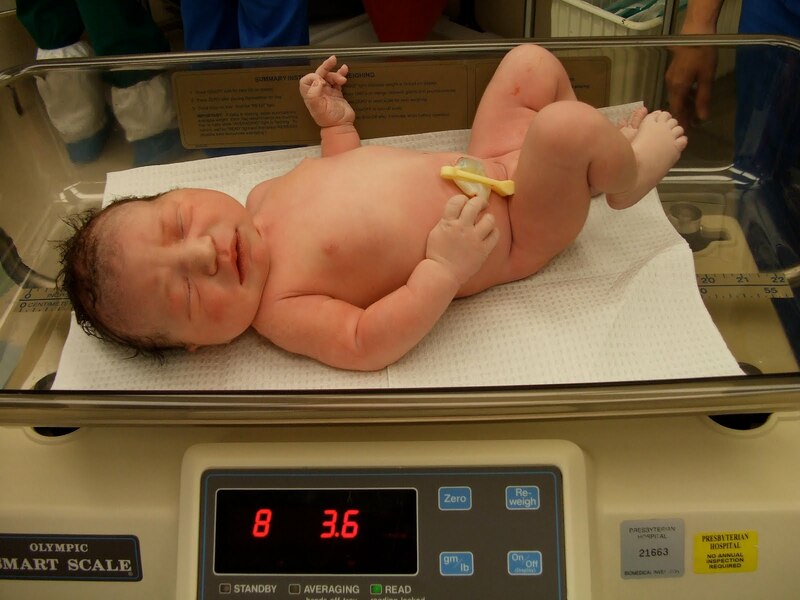 You were born happy and haealthy at 10-:24pm, weighing 8lbs, 4oz, and 20.25 inches long. What a beautiful moment hearing your cry for the first time. We were so blessed the moment you came into our lives. Parker Ann....you changed our lives forever....and definitely for the better. I loved reading this! I am so glad you posted it! I am sure this is going to sound crazy but you know how newborn photos don't always look like the baby/child? Parker's do! She has such distinct facial features...and again looks just like Miss Grace! Precious! I love that!! And yes you have forever changed our lives! I love you so much Parker Ann! !